Last time we presented an example of project focused on renewable energy support and promotion. Today’s example is one of the most popular present PC role-playing games – Kingdom Come: Deliverance produced by Czech Warhorse studio. 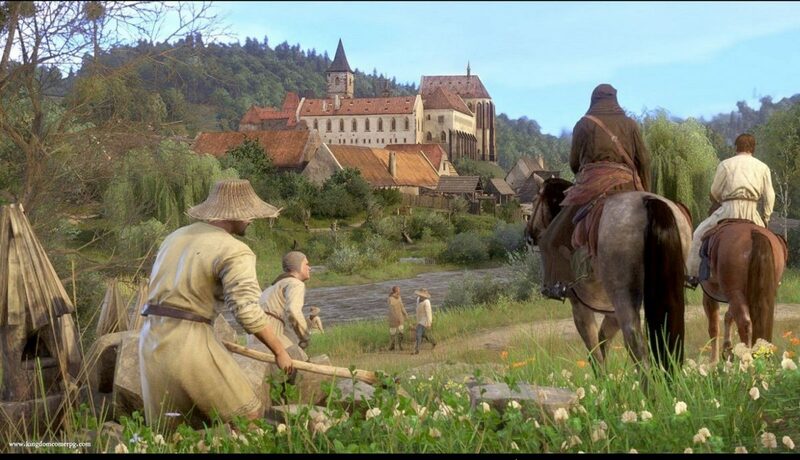 Kingdom Come belongs to most expensive PC games, that were ever produced in Czech Republic. Even there were already successful games in the past, none of them was so different and original. The authors of the game decided to create a purely historical game that will perfectly simulate life in Bohemia at the time of Wenceslas IV’s reign, including realistic historical battles. The game is based on a real historical fact and is situated to the region around Sázava monastery. The authors created not only the exact digital copy of the monastery, depicting the monastery exactly as it was at that time, but also an exact copy of the surrounding landscape, the valley of the Sazava River. The game was created by already well-known game programmer Daniel Vávra. Daniel Vávra was more than 15 years ago one of the authors of perhaps the most successful game of Czech origin, the trilogy Mafia. Mafia became world famous action game and the producers sold over two million copies, to players that were attracted by a quality story reminiscent of the legendary Godfather, dubbing and sophisticated environment. But this time, developers have chosen a very unconventional concept of the game, and instead of spells and different unnatural abilities, they have created a game in which the player can try out the simple life of an ordinary son of a blacksmith living during war between European rulers. Thanks to this concept, the game is very original but also hard. It is for this reason that the developers have been struggling with the interest of publishers who did not trust the idea of ​​creating a purely historical game. Developers have therefore decided to try out funding through crowdfunding. The campaign ran through the Kickstarter portal, http://www.kickstarter.com/projects/1294225970/kingdom-come-deliverance, and ranked among the most successful campaigns to support games. The original goal of the authors was to earn £ 300,000. The goal set has been overcome several times in the campaign, and the authors have managed to collect £ 1,106,371 from over 35,000 contributors.